This chapter covers a number of advanced topics. If you’re new to Icinga, you can safely skip over things you’re not interested in. Downtimes can be scheduled for planned server maintenance or any other targeted service outage you are aware of in advance. Downtimes suppress notifications and can trigger other downtimes too. If the downtime was set by accident, or the duration exceeds the maintenance windows, you can manually cancel the downtime. The most convenient way to schedule planned downtimes is to create them in Icinga Web 2 inside the host/service detail view. Select multiple hosts/services from the listing with the shift key to schedule multiple downtimes. 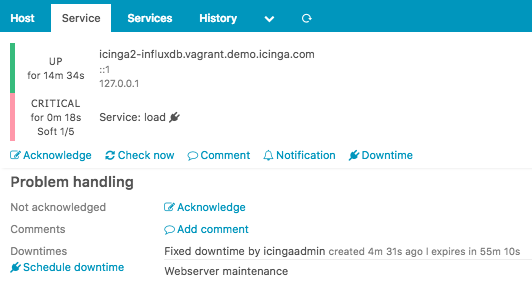 In addition to that you can schedule a downtime by using the Icinga 2 API action schedule-downtime. This is especially useful to schedule a downtime on-demand inside a (remote) backup script, or create maintenance downtimes from a cron job for specific dates and intervals. Multiple downtimes for a single object may overlap. This is useful when you want to extend your maintenance window taking longer than expected. If there are multiple downtimes triggered for one object, the overall downtime depth will be greater than 1. If the downtime was scheduled after the problem changed to a critical hard state triggering a problem notification, and the service recovers during the downtime window, the recovery notification won’t be suppressed. Planned downtimes are also taken into account for SLA reporting tools calculating the SLAs based on the state and downtime history. A fixed downtime will be activated at the defined start time, and removed at the end time. During this time window the service state will change to NOT-OK and then actually trigger the downtime. Notifications are suppressed and the downtime depth is incremented. Common scenarios are a planned distribution upgrade on your linux servers, or database updates in your warehouse. The customer knows about a fixed downtime window between 23:00 and 24:00. After 24:00 all problems should be alerted again. Solution is simple - schedule a fixed downtime starting at 23:00 and ending at 24:00. Unlike a fixed downtime, a flexible downtime will be triggered by the state change in the time span defined by start and end time, and then last for the specified duration in minutes. Imagine the following scenario: Your service is frequently polled by users trying to grab free deleted domains for immediate registration. Between 07:30 and 08:00 the impact will hit for 15 minutes and generate a network outage visible to the monitoring. The service is still alive, but answering too slow to Icinga 2 service checks. For that reason, you may want to schedule a downtime between 07:30 and 08:00 with a duration of 15 minutes. The downtime will then last from its trigger time until the duration is over. After that, the downtime is removed (may happen before or after the actual end time!). If the host/service changes into a NOT-OK state between the start and end time window, the downtime will be marked as in effect and increases the downtime depth counter. A flexible downtime defines a time window where the downtime may be triggered from a host/service NOT-OK state change. It will then last until the specified time duration is reached. That way it can happen that the downtime end time is already gone, but the downtime ends at trigger time + duration. This is optional when scheduling a downtime. If there is already a downtime scheduled for a future maintenance, the current downtime can be triggered by that downtime. This renders useful if you have scheduled a host downtime and are now scheduling a child host’s downtime getting triggered by the parent downtime on NOT-OK state change. ScheduledDowntime objects can be used to set up recurring downtimes for services. Icinga 2 attempts to find the next possible segment from a ScheduledDowntime object’s ranges attribute, and wont create multiple downtimes in the future. In case you need all these downtimes planned and visible for the next days, weeks or months, schedule them manually via the REST API using a script or cron job. If ScheduledDowntime objects are synced in a distributed high-availability setup, both will create the next possible downtime on their own. These runtime generated downtimes are synced among both zone instances, and you may see sort-of duplicate downtimes in Icinga Web 2. Comments can be added at runtime and are persistent over restarts. You can add useful information for others on repeating incidents (for example “last time syslog at 100% cpu on 17.10.2013 due to stale nfs mount”) which is primarily accessible using web interfaces. You can add a comment either by using the Icinga 2 API action add-comment or by sending an external command. If a problem persists and notifications have been sent, you can acknowledge the problem. That way other users will get a notification that you’re aware of the issue and probably are already working on a fix. Note: Acknowledgements also add a new comment which contains the author and text fields. You can send an acknowledgement either by using the Icinga 2 API action acknowledge-problem or by sending an external command. The acknowledgement is removed if a state change occurs or if the host/service recovers (OK/Up state). If you acknowledge a problem once you’ve received a Critical notification, the acknowledgement will be removed if there is a state transition to Warning. If you prefer to keep the acknowledgement until the problem is resolved (OK recovery) you need to enable the sticky parameter. Once a problem is acknowledged it may disappear from your handled problems dashboard and no-one ever looks at it again since it will suppress notifications too. This fire-and-forget action is quite common. If you’re sure that a current problem should be resolved in the future at a defined time, you can define an expiration time when acknowledging the problem. Icinga 2 will clear the acknowledgement when expired and start to re-notify, if the problem persists. Time Periods define time ranges in Icinga where event actions are triggered, for example whether a service check is executed or not within the check_period attribute. Or a notification should be sent to users or not, filtered by the period and notification_period configuration attributes for Notification and User objects. The TimePeriod attribute ranges may contain multiple directives, including weekdays, days of the month, and calendar dates. These types may overlap/override other types in your ranges dictionary. If you don’t set any check_period or notification_period attribute on your configuration objects, Icinga 2 assumes 24x7 as time period as shown below. If your operation staff should only be notified during workhours, create a new timeperiod named workhours defining a work day from 09:00 to 17:00.
display_name = "Icinga 2 8x5 TimePeriod"
Below you can see another example for configuring timeperiods across several days, weeks or months. This can be useful when taking components offline for a distinct period of time. "2016-09-30 - 2016-10-30" = "00:00-24:00"
Please note that the spaces before and after the dash are mandatory. Sometimes it is necessary to exclude certain time ranges from your default time period definitions, for example, if you don’t want to send out any notification during the holiday season, or if you only want to allow small time windows for executed checks. The TimePeriod object provides the includes and excludes attributes to solve this issue. prefer_includes defines whether included or excluded time periods are preferred. The time period prod-notification defines the default time ranges and adds the excluded time period names as an array. Hosts or services which do not actively execute a check plugin to receive the state and output are called “passive checks” or “external check results”. In this scenario an external client or script is sending in check results. Each time a new check result is received, the next expected check time is updated. This means that if there are no check result received from the external source, Icinga 2 will execute freshness checks. The REST API action allows to specify the check_source attribute which helps identifying the external sender. This is also visible in Icinga Web 2 and the REST API queries. In Icinga 2 active check freshness is enabled by default. It is determined by the check_interval attribute and no incoming check results in that period of time. The process-check-result REST API action allows to overrule the pre-defined check interval with a specified TTL in Icinga 2 v2.9+. If the freshness checks fail, Icinga 2 will execute the defined check command. Best practice is to define a dummy check_command which gets executed when freshness checks fail. Icinga 2 supports optional detection of hosts and services that are “flapping”. Flapping occurs when a service or host changes state too frequently, which would result in a storm of problem and recovery notifications. With flapping detection enabled a flapping notification will be sent while other notifications are suppressed until it calms down after receiving the same status from checks a few times. Flapping detection can help detect configuration problems (wrong thresholds), troublesome services or network problems. Flapping detection can be enabled or disabled using the enable_flapping attribute. The flapping_threshold_high and flapping_threshold_low attributes allows to specify the thresholds that control when a host or service is considered to be flapping. The default thresholds are 30% for high and 25% for low. If the computed flapping value exceeds the high threshold a host or service is considered flapping until it drops below the low flapping threshold. Note: There is no distinctions between hard and soft states with flapping. All state changes count and notifications will be sent out regardless of the objects state. All the states are weighted, with the most recent one being worth the most (1.15) and the 20th the least (0.8). The states in between are fairly distributed. The final flapping value are the weighted state changes divided by the total count of 20. In the example above, the added states would have a total value of 7.82 (0.84 + 0.86 + 0.88 + 0.9 + 0.98 + 1.06 + 1.12 + 1.18). This yields a flapping percentage of 39.1% (7.82 / 20 * 100). As the default upper flapping threshold is 30%, it would be considered flapping. If the next seven check results then would not be state changes, the flapping percentage would fall below the lower threshold of 25% and therefore the host or service would recover from flapping. The volatile option, if enabled for a host or service, makes it treat every state change as a HARD state change. It is comparable to max_check_attempts = 1. With this any NOT-OK result will ignore max_check_attempts and trigger notifications etc. It will further cause any additional NOT-OK result to re-send notifications. It may be reasonable to have a volatile service which stays in a HARD state if the service stays in a NOT-OK state. That way each service recheck will automatically trigger a notification unless the service is acknowledged or in a scheduled downtime. A common example are security checks where each NOT-OK check result should immediately trigger a notification. The default for this option is false and should only be enabled when required. Why should you do that? Icinga and its components run like any other service application on your server. There are predictable issues such as “disk space is running low” and your monitoring suffers from just that. You would also like to ensure that features and backends are running and storing required data. Be it the database backend where Icinga Web 2 presents fancy dashboards, forwarded metrics to Graphite or InfluxDB or the entire distributed setup. This list isn’t complete but should help with your own setup. Windows client specific checks are highlighted. System Logs Forward them to Elastic Stack or Graylog and add your own alerts. Database Housekeeping Check the database size and growth and analyse metrics to examine trends. Notifications Messengers, Cloud services XMPP, Twitter, IRC, Telegram, PagerDuty, VictorOps, etc. Metrics PNP, RRDTool check_pnp_rrds checks for stale RRD files. The icinga CheckCommand provides metrics for the runtime stats of Icinga 2. You can forward them to your preferred graphing solution. If you require more metrics you can also query the REST API and write your own custom check plugin. Or you keep using the built-in object accessor functions to calculate stats in-memory. There is a built-in ido check available for DB IDO MySQL/PostgreSQL which provides additional metrics for the IDO database. More specific database queries can be found in the DB IDO chapter. Distributed setups should include specific health checks. You might also want to add additional checks for SSL certificate expiration. Apply rules can be used to create a rule set which is entirely based on host objects and their attributes. In addition to that apply for and custom attribute override extend the possibilities. A ping4 check using the local IP address of the web server. A tcp check querying the TCP port where the HTTP service is running on. If the url key is defined, the third apply for rule will create service objects using the http CheckCommand. In addition to that you can optionally define the ssl attribute which enables HTTPS checks. assign where config.url != ""
The variables defined in the host dictionary are not using the typical custom attribute prefix recommended for CheckCommand parameters. Instead they are re-used for multiple service checks in this example. In addition to defining check parameters this way, you can also enrich the display_name attribute with more details. This will be shown in in Icinga Web 2 for example. The other way around you can create objects dynamically using your own global functions. Functions called inside command objects share the same global scope as runtime macros. Therefore you can access host custom attributes like host.vars.os, or any other object attribute from inside the function definition used for set_if or command. Build them step-by-step. You can always refactor your code later on. Functions can be registered into the global scope. This allows custom functions being available in objects and other functions. Keep in mind that these functions are not marked as side-effect-free and as such are not available via the REST API. Add a new configuration file functions.conf and include it into the icinga2.conf configuration file in the very beginning, e.g. after constants.conf. You can also manage global functions inside constants.conf if you prefer. globals.<unique_function_name> adds a new globals entry. function() specifies that a call to state_to_string() executes a function. Function parameters are defined inside the function() definition. The else-condition allows for better error handling. This warning will be shown in the Icinga 2 log file once the function is called. If these functions are used in a distributed environment, you must ensure to deploy them everywhere needed. In order to test-drive the newly created function, restart Icinga 2 and use the debug console to connect to the REST API. You can see that this function is now registered into the global scope. The function call state_to_string() can be used in any object at static config compile time or inside runtime lambda functions. The following service object example uses the service state and converts it to string output. The function definition is not optimized and is enrolled for better readability including a log message. To use custom functions as attributes, the function must be defined in a slightly unexpected way. The following example shows how to assign values depending on group membership. All hosts in the slow-lan host group use 300 as value for ping_wrta, all other hosts use 100. If a simple expression for matching a name or checking if an item exists in an array or dictionary does not fit, you should consider writing your own global functions. You can call them inside assign where and ignore where expressions for apply rules or group assignments just like any other global functions for example match. The following example requires the host myprinter being added to the host group printers-lexmark but only if the host uses a template matching the name lexmark*. Take a different more complex example: All hosts with the custom attribute vars_app as nested dictionary should be added to the host group ABAP-app-server. But only if the app_type for all entries is set to ABAP. The solution for this problem is to register a global function which checks the app_type for all hosts with the vars_app dictionary. The set_if attribute inside the command arguments definition in the CheckCommand object definition is primarily used to evaluate whether the command parameter should be set or not. By default you can evaluate runtime macros for their existence. If the result is not an empty string, the command parameter is passed. This becomes fairly complicated when want to evaluate multiple conditions and attributes. The following example was found on the community support channels. The user had defined a host dictionary named compellent with the key disks. This was then used inside service apply for rules. The more significant problem was to only add the command parameter --disk to the plugin call when the dictionary compellent contains the key disks, and omit it if not found. This implementation uses the dictionary type method contains and will fail if host.vars.compellent is not of the type Dictionary. Therefore you can extend the checks using the typeof function. This comes in handy for NotificationCommands or EventCommands which does not require a returned checkresult including state/output. The following example was taken from the community support channels. The requirement was to specify a custom attribute inside the notification apply rule and decide which notification script to call based on that. assign where user.name == "short-dummy"
The solution is fairly simple: The command attribute is implemented as function returning an array required by the caller Icinga 2. The local variable mailscript sets the default value for the notification scrip location. If the notification custom attribute short is set, it will override the local variable mailscript with a new value. The mailscript variable is then used to compute the final notification command array being returned. You can omit the log() calls, they only help debugging. The Object Accessor Functions can be used to retrieve references to other objects by name. This allows you to access configuration and runtime object attributes. A detailed list can be found here. vars.dummy_text = "This host is down." vars.dummy_text = "This host is up." var output = "Cluster hosts:\n"
output += node + ": " + get_host(node).last_check_result.output + "\n"
The following example sets time dependent thresholds for the load check based on the current time of the day compared to the defined time period. In addition to the default value types Icinga 2 also uses a few other types to represent its internal state. The following types are exposed via the API. exit_status Number The exit status returned by the check execution. output String The check output. performance_data Array Array of performance data values. check_source String Name of the node executing the check. state Number The current state (0 = OK, 1 = WARNING, 2 = CRITICAL, 3 = UNKNOWN). command Value Array of command with shell-escaped arguments or command line string. execution_start Timestamp Check execution start time (as a UNIX timestamp). execution_end Timestamp Check execution end time (as a UNIX timestamp). schedule_start Timestamp Scheduled check execution start time (as a UNIX timestamp). schedule_end Timestamp Scheduled check execution end time (as a UNIX timestamp). active Boolean Whether the result is from an active or passive check. vars_before Dictionary Internal attribute used for calculations. vars_after Dictionary Internal attribute used for calculations. ttl Number Time-to-live duration in seconds for this check result. The next expected check result is now + ttl where freshness checks are executed. Icinga 2 parses performance data strings returned by check plugins and makes the information available to external interfaces (e.g. GraphiteWriter or the Icinga 2 API). label String Performance data label. value Number Normalized performance data value without unit. counter Boolean Enabled if the original value contains c as unit. Defaults to false. unit String Unit of measurement (seconds, bytes. percent) according to the plugin API. crit Value Critical threshold value. warn Value Warning threshold value. min Value Minimum value returned by the check. max Value Maximum value returned by the check.